RTEC’s Element Series grows up with the Boson, an extremely small on-metal UHF RFID tag that measures just 5 mm x 5 mm x 3.2 mm and provides read range up to 2 meters. 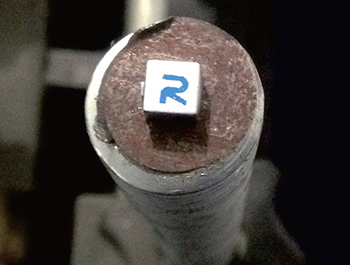 The RTEC Boson is suitable for tagging small metal assets such as weapons, metallic hand tools, IT assets, medical equipment, work in process parts during manufacturing, small metallic assets in general. Thanks to its durable ceramic construction, which is rated IP68 and protects the internal electronics from temperature up 150°C, this small on-metal UHF tag represents a reliable solution for very harsh environments. The Boson can be delivered with pre-encoding and several other customization options, ATEX certification included. The tag is available in silver as standard color, but others are available upon special request. Customers can order different product versions optimized to provide optimal performance in accordance with regulations of any specific world region. Please ask RTEC for additional details on this small on-metal UHF RFID tag. If interested in RFID tags for other applications, do try our RFID Tag Search Engine or contact us at info@veryfields.net, also for suggestions on complete RFID solutions. This entry was posted in RFID News, RFID tags and tagged RTEC. Bookmark the permalink.